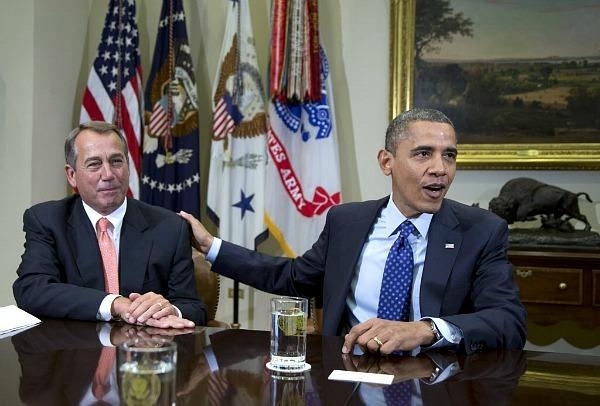 What should Congress do on the Fiscal Cliff? 1) Lock in $1.2 trillion in ten-year sequester savings. 2) Extend ALL current tax rates for one year. 3) Reform taxes and entitlements to avert another debt downgrade. Questions? P.S. From now on, every debt ceiling increase should be offset by an equivalent amount of spending reductions, in the same bill. No more kicking the can down the road! May I suggest: “The National Federal Deficit Reduction Act of 2012. This is a temporary act of Congress to resolve a fiscal crisis ($16 trillion dollars of debt), most of which other sovereigns are the creditors, which has threatened the sovereignty and credit of the nation, and acting under the US Constitution and taxing and commerce authority granted therein, the US will impose the following tax which shall continue until such time the federal deficit shall decrease to a level lower than $5 trillion dollars: It shall be the law that that: (1) each manufacturer of personal property of any kind shall certify on the box or label of every item sold in the United States whether or not it is (x) assembled abroad or (y) assembled in the US but parts consisting more than 85% imported. Manufacturers shall operate in good faith and failure to provide labels shall impose an automatic federal tax unless and until such time a proper label is put on the product. (2) each retailer to the consumer shall collect a 5% federal tax on (x) all imported goods and (y) goods assembled in the US but parts consisting more than 85% imported. Retailers shall operate in good faith and fines assessed by the IRS or any of its agencies on retailers failing to collect such tax shall be mandated for the noncompliance by such retailers. (3) Federal tax shall be charged to the consumer, collected by the retailer, and quarterly sent to the IRS.” -- It is a thought -- Out of the Box and no old ladies lose money and the rich can keep employing and buying things to stimulate the economy and - hey maybe manufacturing will move back to the US! I would go a step further and let the Bush Tax Cuts expire with any increase in revenue, every dollar goes to debt reduction. NOT ONE PENNY gets spent. Go back to Graham, Rudman, Hollings. Also, DO NOT repeal any Obamacare taxes, he owns them, do not let him off the hook. Once we have more tax payers, more people with "skin" in the game we can then have a serious discussion on Cutting Spending and Cutting Taxes. To: Senate Majority Leader Reid, President ObamaAmericans face a time of great economic challenge, and have watched with equally great interest as the House of Representatives and now the Senate have crafted legislation designed to address that challenge. Last night, news of a compromise was announced in the Senate that would provide the sixty votes required to move the bill forward. As of the writing, however, the full details of the compromise have not been made public, and no legislative text has been published for open review. This morning I was reading an interesting article in The Washington Times.My favorite paragraph:Sen. Susan Collins, Maine Republican, told reporters after meeting with the president that she thinks the White House should have written the stimulus bill instead of offering broad principles to Congress for it to craft the plan.I hope this is sarcasm, but I fear even my naturally optimistic attitude won’t allow that. Tom Daschle: "Tax Cheaters Cheat Us All"
Or rather, spreading the pain and the blame. (a) He talks about economics (b) He says he believes in lower government spending (c) Even the left-leaning Associated Press says he's misleading voters (d) All of the above For today's installment of answer (d), see today's AP article on Obama's infomercial last night: "Obama's prime-time ad skips over budget realities"
Shorter Ruth Marcus: What America really needs is higher taxes. In fact, it would be totally awesome campaign strategy for a Republican to just say, "Yeah, higher taxes! We need 'em!" Because clearly, GOP voters eat that sort of thing up. On Wednesday afternoon, Senator Wayne Allard (R-CO) introduced an amendment to the Senate Budget Bill. The amendment, which he called "The Obama Spendorama" went down to defeat, with Allard himself voting against it, but it brought an important point to the forefront of the budget debate. You can read my entire discussion of the amendment at HumanEvents.com.